Civil War Film's Haunting Ashokan Melody Ties to Hart Island Cavalry History. The 2.44-minute midi file in this page plays only 1 time on loading. www.correctionhistory.org hosts the New York Correction History Society's web pages. Civil War Documentary's Haunting Melody Ties to Hart's Cavalry History. Jay Ungar & Molly Mason. Jay Ungar did not have the Civil War in mind when he wrote his hauntingly beautiful melody in 1982. It was written as a lament after another summer session of his and Molly Mason's Fiddle & Dance Workshop had ended at SUNY's Ashokan Field Campus in the Catskills, about 10 miles from Kingston. Back in the huge, cold and impersonal city, Jay "was experiencing a great feeling of loss and longing" for the small community closeness of their woodland music workshop and its idyllic rusticism. In 1983, their Fiddle Fever band recorded Jay's until-then unnamed melody and adopted Molly's suggestion that they title it Ashokan Farewell. In 1984 Ken Burns heard the piece on their Waltz of the Wind album. He used the melody as background music a total of 59 minutes 33 seconds during his 11-hour Civil War documentary. Though Ashokan Farewell was not written with the Civil War in mind, NYCHS research finds that Hart Island's CW history includes a connection to the Ashokan area from whence came -- 118 years after that conflict -- the inspiration for the melancholic melody so appropriate to remembering lives and loves lost in the war . . . perhaps in all wars. 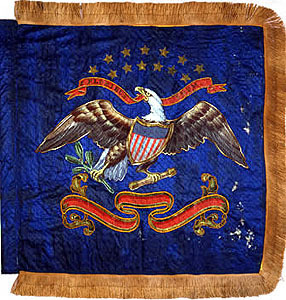 Battle flag of 25th Cavalry Reg. that mustered in at Saratoga & Hart Island between Feb. and Oct. 1864. Source: NY Military Museum & Veterans Research Center. At the start of the Civil War -- about a half century before eight of their villages were flooded over during the construction of Ashokan Reservoir to satisfy NYC's thirst for upstate fresh water -- men of Ashokan Valley began volunteering for military service in the Union cause. They continued to do so throughout the long years of that conflict. 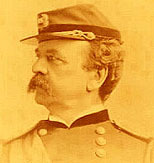 Among the several companies that comprised the 25th Cavalry Regiment -- nicknamed Sickles' Cavalry for Major Gen. Daniel E. Sickles -- were a half dozen units that mustered in on Hart Island, including two companies (Co. L on Oct. 15 and Co. M on Oct. 20, 1864) which had recruited their men from Ashokan Valley and other communities in and around Kingston. Most of those in the regiment who survived the war mustered out on Hart Island June 27, 1865. They included several from the Ashokan/Kingston area. At least a few from the Ashokan Valley region would likely have been among the 66 who had not survived. For those too often forgotten Ashokans who risked or gave up their lives in preserving the nation's union, the Farewell turns out to be a long-overdue musical salute, albeit unintended and therefore more than a bit ironic. Time -- like the reservoir waters which flooded over the Ashokans' villages -- seemed to have completely washed away memory of the sacrifices made by the men of the valley and their families for the Union. But now millions of Americans who see Ken Burns' documentary and hear Jay Ungar's melody in its background will ever link in memory those sweet sad notes to the waste wrought by that war. As the Ashokan Farewell credits scroll swiftly up the screen, the flood waters of time recede for the briefest blink of a second, revealing the lost link between that lost valley and the loss of years and lives from the valley in that war. Little wonder the music inspired by its woodlands would be so haunting. © NYCHS reserves and retains all rights to the text other than quoted excerpts. Non-commercial educational use permitted provided NYCHS and/or its web site -- www.correctionhistory.org -- is credited as the source. 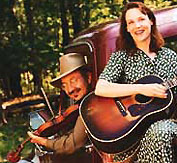 For more about how Ashokan Farewell came to be written, named, recorded and then used in the Ken Burns Civil War Documentary visit the web site of Jay Ungar and Molly Mason. 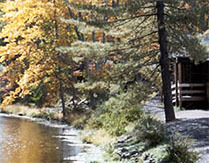 For more about the melody's inspirational setting, visit the web site of the Ashokan Field Campus, an outdoor/environmental education center owned and operated by Campus Auxiliary Services of SUNY at New Paltz. 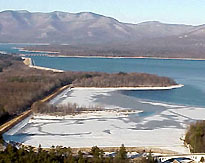 For more about the Ashokan, one of the two reservoirs in NYC's Catskill Water Supply System, visit NYC's Department of Environmental Protection's watershed web pages. For more about the 25th Cavalry Reg. and its battle flag, visit the web site of the NY Military Museum and Veterans Research Center of the New York State Division of Military and Naval Affairs: Military History. For more images of the Soldiers and Sailors Monument at Old City Hall, Kingston, and other Hudson Valley CW monuments, visit Joel Craig's Bivouac on the web. For more about Major Gen. Daniel E. Sickles, whose name attached to the 25th Cavalry Reg., visit Part 2 of the Meet Rikers Union Army Recruiter Sgt. Barnard C. Gardner presentation elsewhere on our web site. NYCHS appreciates The Past Whispers webmaster Nancy Brister making available a copy of the Ashokan Farewell midi file (sequenced by Barry Taylor) used here. The melody plays on her home page that I came across while researching the Sgt. Gardner story. When I learned the beautiful woodlands west of Kingston had inspired the composition, I researched whether any of the Civil War regiments which mustered in and/or out of Rikers or Hart Island had recruited companies from that Catskills region. Thus this presentation came about.